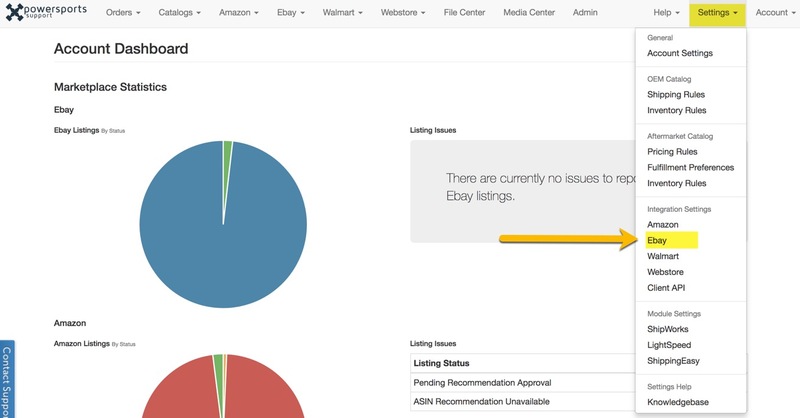 After you have completed the Authorization with eBay there are still a few settings that need to be filled out. Enabling this options will allow PSS to keep listings that go out of stock in an online status. If a listing is out of stock upon creation, it will not create. When inventory comes back in stock PSS will detect it and create the listing at that time. If you have a re-pricer or other 3rd party managing your pricing you can check this box and eBay listings will not receive price updates during revisions. When enabled, eBay listings will not show discount pricing information. If you do not wish to sell products on eBay below a certain amount you can enter that value here. An entered value of 25, will restrict any positive inventory from being sent to listings of products that have a price below $25. If you do not wish to sell products on eBay above a certain amount you can enter that value here. An entered value of 500, will restrict any positive inventory from being sent to listings of products that have a price below $500. Choose to have the Maximum Price Threshold apply to MSRP or the Calculated Price (either by Price Rules or Overrides). Enabling this option will ignore all tax settings for listings supplied by PSS and will make use of the tax table set for the account. If your state requires sales tax, please choose your state here. Powersports Support highly recommends that you have thorough policies and disclaimers in order to prevent confusion with buyers and to protect yourself. During the holiday season, you can offer longer than normal return windows for customers who are purchasing gifts and need extra time to process returns. This will be populated in every listings' item specifics and is limited to 50 characters. Not a bad idea for blanket statements like "Stock Photo Used" or "Reference actual MPN for item". When a PSS catalog item is missing an image you may check this box and the listing will go online with your logo as the image until PSS catalog updates. Enter the URL for your logo in the URL field. *Powersports Support tries to release data in the most complete form possible however given the nature of the industry and lack of clean, web-ready data from the distributors, there can be some holes in the catalog in regards to images. By default, PSS will set all listings to ship with no excluded locations. By using the list of Countries in this feature, a seller may choose to override this behavior and exclude one or more regions from shipping. Select as many countries from the list as you wish to have excluded.